This is an upgraded version for our previous B0317 indoor/outdoor thermo-hygrometer. It has three touch buttons with clearer display and featured upgrades. You can set everything just by touching the three buttons on the screen. A wireless remote sensor is included to detect outdoor temperature and humidity. 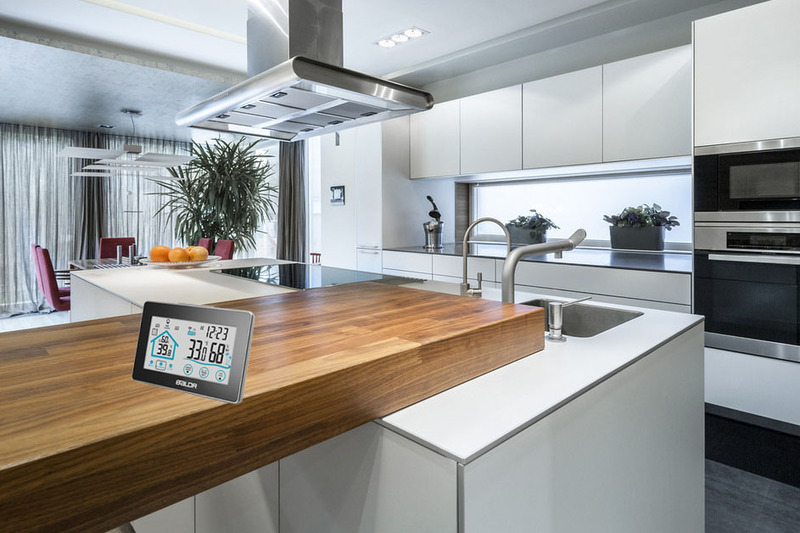 You can touch the button to check Max/Min/current temperature and humidity whenever you want. There are also icons to remind you the humidity changes and display the comfort status. Time also displays for you to check when you see the temperature and humidity data. When it is dark, you can press the light button on top. The white backlight will be lit for a few seconds. The main unit can be matched up to 3 remote sensors. The CH button on screen is for switching channels. Remark: For channel matching, you need to power on the main unit first, then load batteries for remote sensor and turn the sensor to the channel you want to match (channel switch button is inside the battery compartment). If you want to manually update or reconnect the matched display on screen, you can press and hold the CH button on screen, and the data will be cleared.